A few people have asked about the dog I use for Jackrabbit hunting, a 3 year old Dachshund/Lab mix named Marley. I have used dogs growing up for hunting rabbits, hares and birds quite often over the years. Marley is very unique as some may consider her breed a house dog, she is simply not the case at all. The standard size dachshund was developed to scent, chase, and flush out badgers and other burrow-dwelling animals, while the miniature dachshund was bred to hunt smaller prey such as rabbits. In the United States, they have also been used to track wounded deer and hunt prairie dogs. Marley is a Lab mix that adds to her hunting ability being fairly larger and too very good at retrieving and swimming if need be. This mixed breed has more of the temperament and strength of a Lab but obviously being so short she has a much easier time getting in under cover more easily and too being so small can stalk better. The downfall of her size as a hunting dog is I need to sometimes keep her close as shes susceptible to birds of prey and other predators. In some areas I will even leash her for these reasons as I have had birds stoop on her in the open plains. I first started Airgun hunting with her about a year ago and found that she was very natural at it, needing very little work making her safe around a gun. 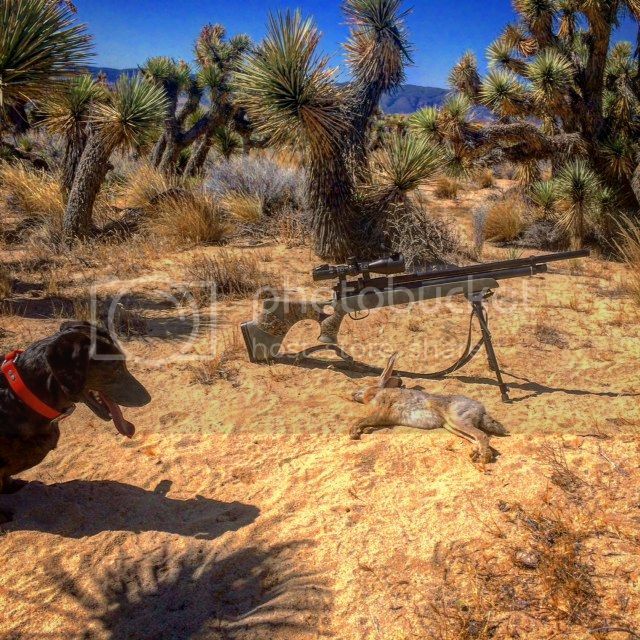 She quickly learned what a gun was and too what it was capable of, seeing me take several Cottontails and Jackrabbits excited her. After taking her on several hunts she began to learn that when I aimed the gun and fired it she could hear the “hit” and go that direction finding a kill. I would let her get familiar with the scent of the animal and too familiarize her with the areas they are found. Before I knew it she was spotting them before me and getting really good at it. We had spent several months hunting by ourselves before I felt comfortable bringing another hunter along with us. I wanted to make sure that she was 100% safe and followed all commands such as STAY, HERE and GO AHEAD. The first word is STAY and that means I want her to stay where she is and wait for me. The second word is HERE and that means I want her to stay by my side within several feet and sometimes be on a leash if I feel predators may be in the vicinity. The third word is GO AHEAD and that means I want her to seek out animals by scent, sight or by flushing them. After working with her and giving rewards when she follows a command it became much more natural for us both and became almost automatic and in some cases she would just know what to do. We sometimes would just sit and wait with both of us watching the hillsides for activity. I remember our first successful hunt together and how excited and happy she was to finally get a kill on a very large Jackrabbit that we took down at 85 yards. We were hiking across a dry river bed up into a thick brush-line where we spotted a Jackrabbit running up an embankment. I took my shot leaving a very loud THWACK that was very identifiable sending Marley at full speed up the hill to make sure it was expired and to retrieve. After several more hunts I ended up feeling comfortable enough to invite Terry to join us and too for Marley to get familiar with being around other hunters. Her safety was my number one concern so I kept her close to my side for the first few minutes just to let her see that we now had “two” guns in use. Pretty soon I was comfortable letting her GO AHEAD and to now be able to assist us both in locating some Jackrabbits. Marley and Terry became friends very quickly and sometimes she would walk with him for awhile. Marley was soon getting very good at what she does. 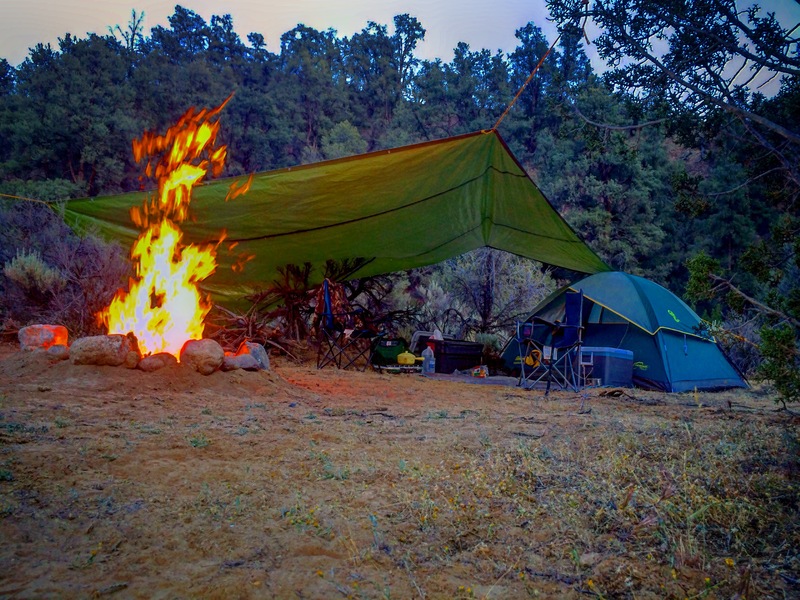 After awhile she was joining us on several hunts where we ventured deep into the back-country for days at a time camping in some very unforgiving terrain. 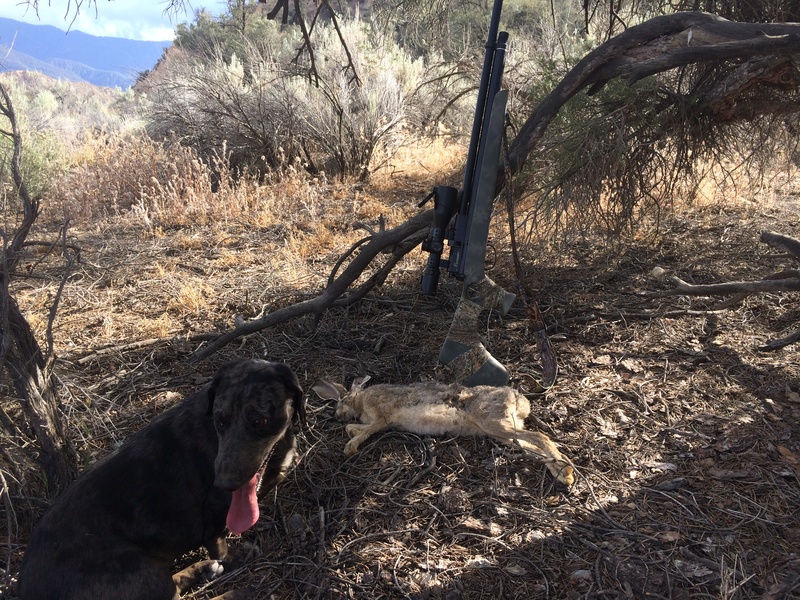 One of our hunting trips took us miles from camp where her and I killed several Jackrabbits from over several hundred yards away, some of the retrievals she made were from rocky hillsides and thick brush. 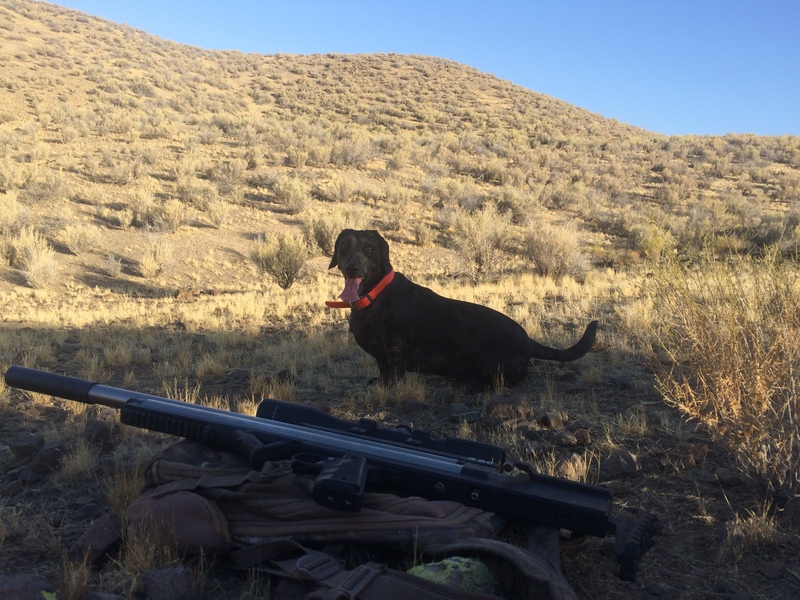 Using an Airgun to hunt with is difficult enough so having some help from a well trained dog like Marley makes hunting a whole lot more enjoyable. The nice part about using an Airgun is the noise levels are much lower than with a traditional firearm, this makes it enjoyable for both me and the dog. 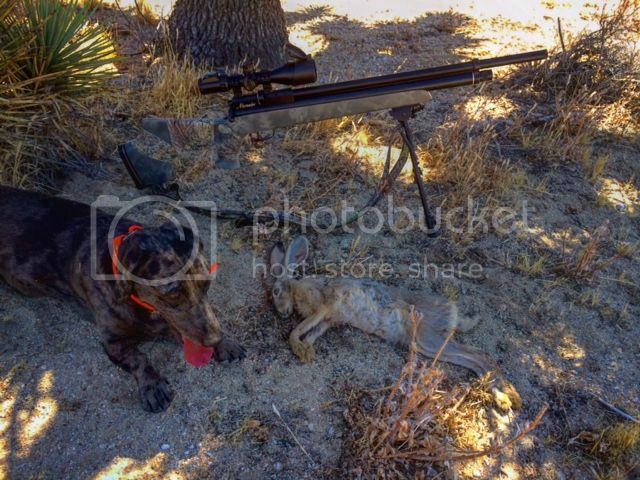 Here is a kill we made using a .357 Slayer Big Bore Airgun, she loves this gun as much as I do. I hope my writing may open some eyes to look towards a dog as a valuable hunting tool, I know Marley has really brought some light into my hunting adventures. She has become a valuable companion and the best hunting buddy I’ve ever known. 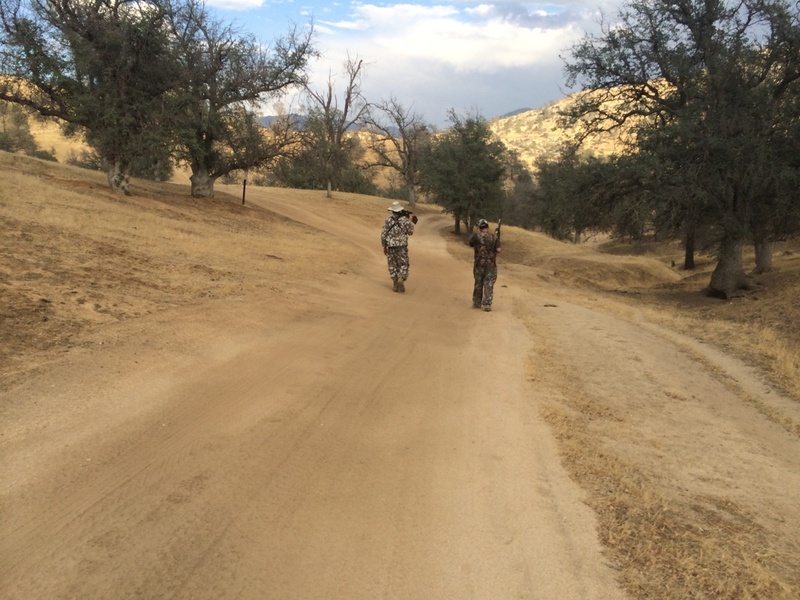 The area we choose for the hunt was in the foothills of the Sequoia forest and offered a very secluded private hunting location with target rich Ground Squirrel and Cottontail habitat. We left to hunt very early Friday morning and arrived in the forest by 7:00 am with the forecast calling for a very hot weekend. 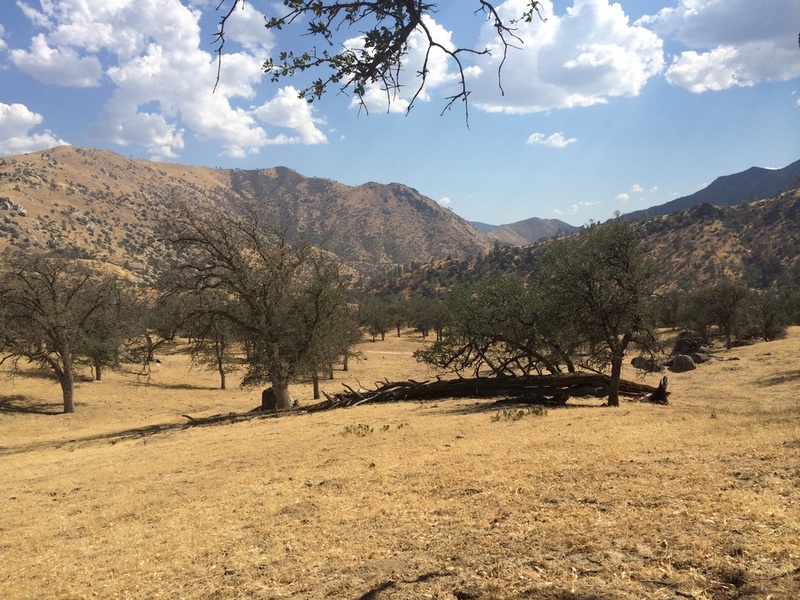 The spot we camped was in a huge valley with Oak trees, rocks and rivers flowing on several sides offering a large abundance of animal and plant life. 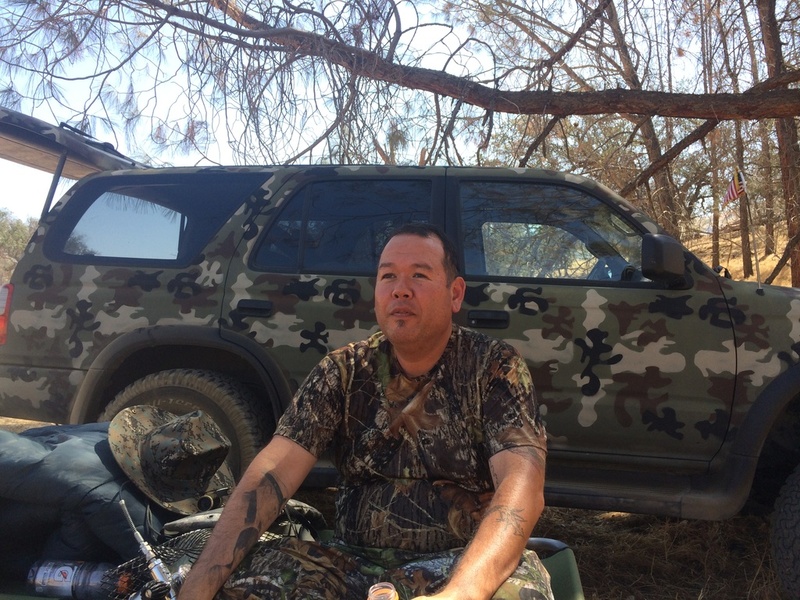 SteveO and I did a big hunt here in the beginning of Spring so we were both very familiar with the hotspots and the lay of the land that stretches for several thousand acres. Most of the area is untouched by hunting pressure as the location is hidden in very rough terrain and during winter almost impossible to reach. 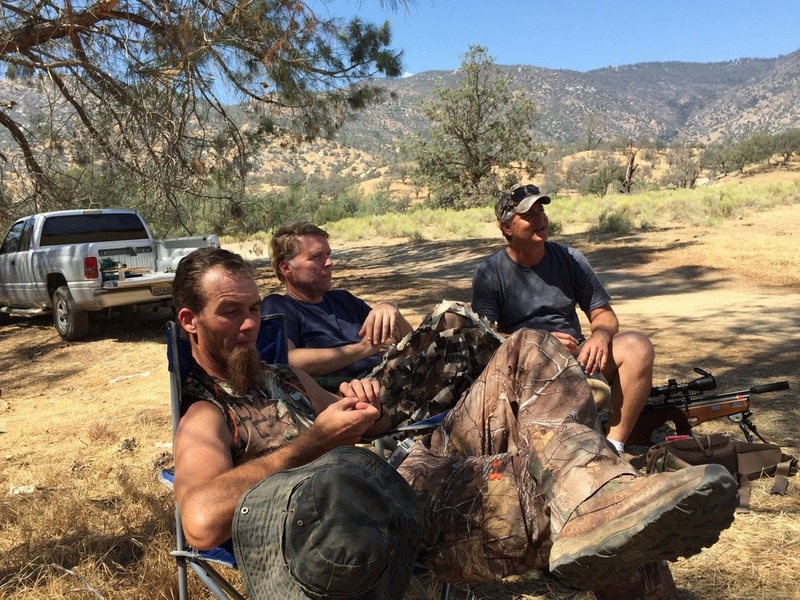 After showing Terry, Jessi and Ray a few of the spots we all set out to hunt throughout the area. By this time it was approaching the high 80’s and only getting hotter up over 100 degrees by 1:00 pm. 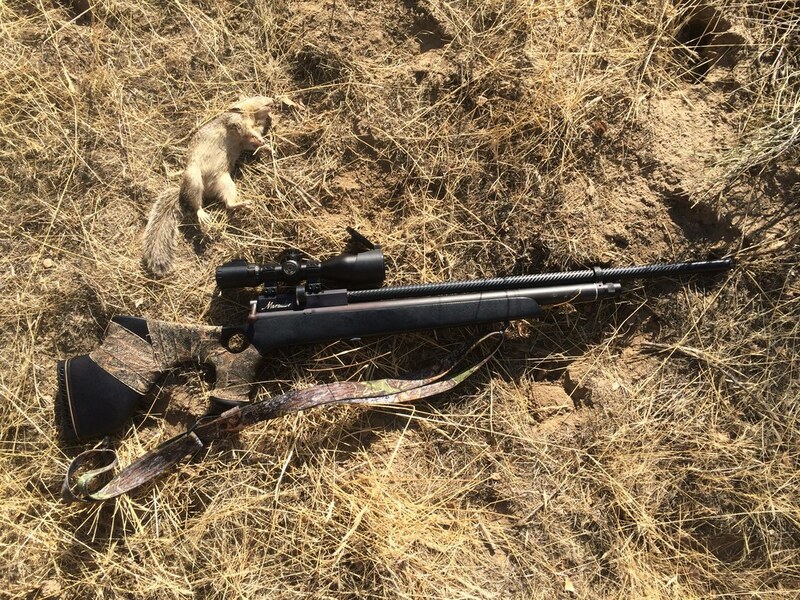 Within several minutes of hunting I had already killed several Ground Squirrels and too could hear the catcher mit sound in the distance of others having some luck as well. After several hours of hunting we all eventually ended back at camp where we were sheltered from the heat with the canopy of pine trees our campsite was nestled under. We sat around talking about our shots, drinking loads of water and having our lunch. The hunting was a bit slow and it was much to hot to be wandering around so Terry set up some targets at various ranges for us all to shoot and plink at. Ray and Jessi had brought several very cool guns for us all to shoot and have some fun with. I was perfectly content sitting in the shade with a nice cold soda and shooting at a bottle I had placed at 137 yards. Was nice to have the time to just have fun with some very cool group of Airgunners. Around 5:00 pm we decided to head out again and were pleasantly surprised by how many Ground Squirrels were out and about, I managed to get 13 by the days end with the total between all of us being in the high 30’s. Around 6:30 pm we all headed back to set up our tents and to place out our chairs to just relax and enjoy each others company, still hot around 88 degrees. Into the evening it became cooler and too being so far from any light pollution offered an amazing view of the stars. The heat had exhausted me just enough that day to make sleeping in it easier than I thought it would be, by 3:30 am it was a low of 77 degrees. 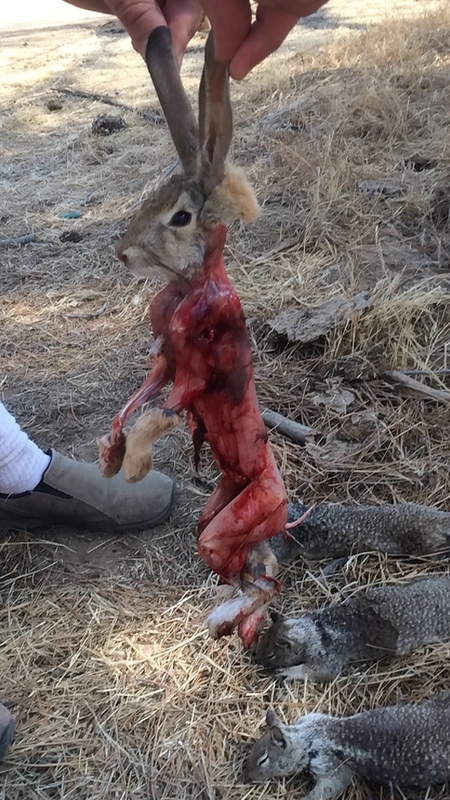 We all got up fairly early and set out to hunt where within minutes Ray made a nice Cottontail kill at around 35 yards. 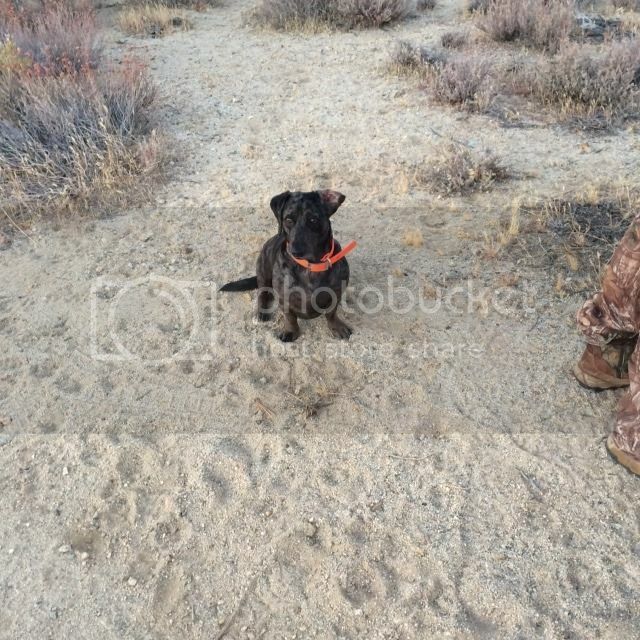 Everyone by this time was having great luck, Jessi (below) got 4 Ground Squirrels and a Cottontail as well. We hiked around and each seemed to be finding more and more active areas, Ray and I hiked around and found a very active area where I was able to take 5 of them. 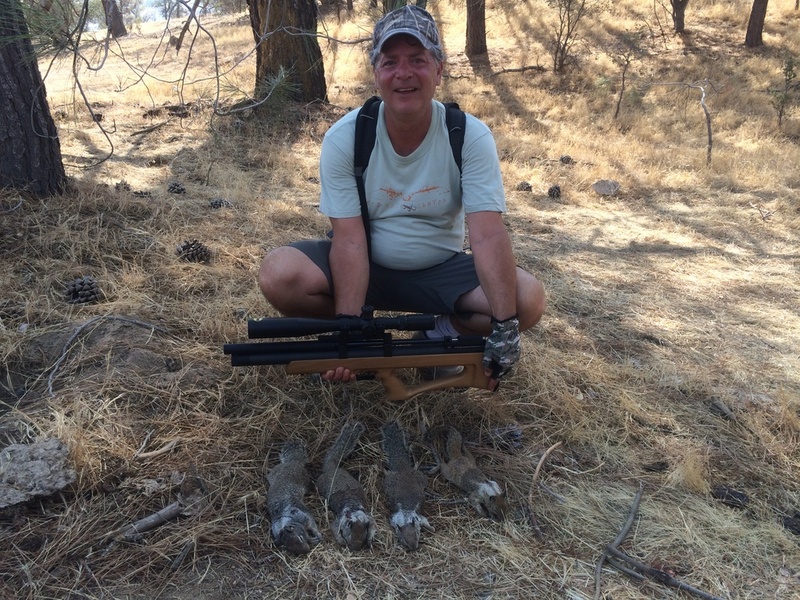 Terry was doing well too with a nice kill on several Ground Squirrels and Cottontail with his double tube Prod. By this time it was getting hot again so we all decided to pack up and make the long journey back up and out of the valley. This was one of the most memorable trips of my life and will never forget the great time we all shared together. Thanks for reading and hope to have some more trips very soon. On Friday November 4th Marley and I left the house at 3:00am to make our way North where we would be spending the next three days. 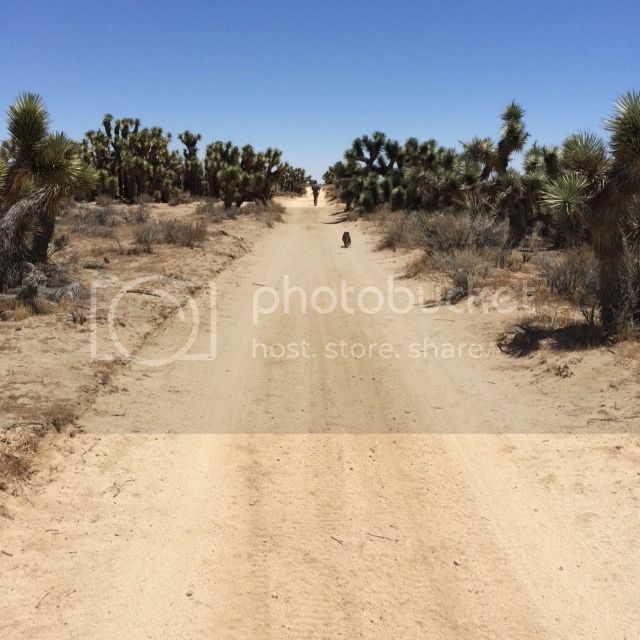 We ventured down the long dirt road that seems to head into nowhere for miles. As we arrived to the area in darkness I parked on top of a mountain where I planned to hunt for several hours while waiting for the other members of our group. The sun was slowly coming up as Marley and I hiked our way high up onto a mountain hoping to have some good views of the fields below. The area was quite dry with very little green vegetation to be seen, yet still very sustainable to Jackrabbit populations. We sat for awhile and didn’t see any movement besides a few birds and the occasional chatter of a ground squirrel. As it was becoming lighter out I could see a dust cloud from a vehicle moving down the road from miles away, It was SteveO making his way right on time. We got up and made our way down the mountain to join him and too ended up making a failed shot on a Jackrabbit on the way down. As soon as SteveO arrived Terry was soon behind with us deciding to move down into an occupied camping area to relax for a bit and also get our gear ready for the few days of hunting. After several minutes of setting up camp and getting our guns aired up we set out on foot back up into a nearby canyon that is usually loaded with Jackrabbits. We all went off to separate areas throughout the valley with my preferred area working the brush filled hillsides. As I’m looking down the hill I can see Terry stalking a Jackrabbit just over the other side of the hill from me, I see him waiving me over as I think he thought the Jackrabbit may come my direction. He ended up tagging the Jackrabbit while making full sprint up the hill, not sure of the yardage but still a great shot. 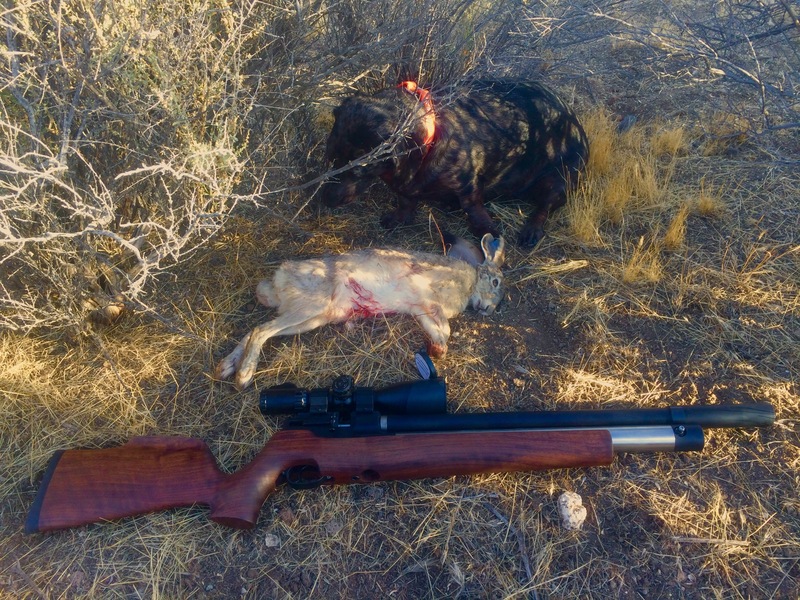 After another hour of marching around I was able to spot two Jackrabbits moving through the brush, the larger one made a much better target and was taken down at 60 yards with Marley making a swift retrieval. 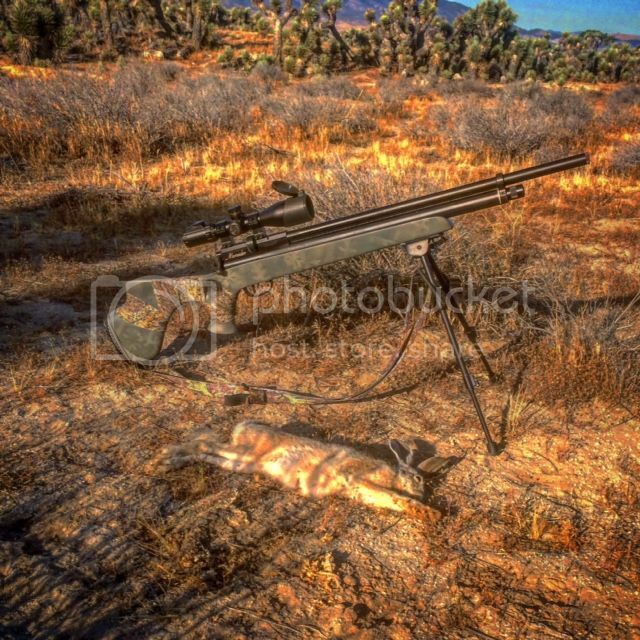 I was using the new American Air Arms EVOL .30 carbine tuned to 85 fpe and too the perfect tool for Jackrabbit hunting. The gun is regulated, lightweight and has a shot-count capable of keeping me in the field all day long. This is my dream gun and one I have been waiting for Tom to build for over two years, I’m in LOVE. After a few more minutes of hiking back to camp we took a much needed break and to have some lunch before heading back out into the remote hills. 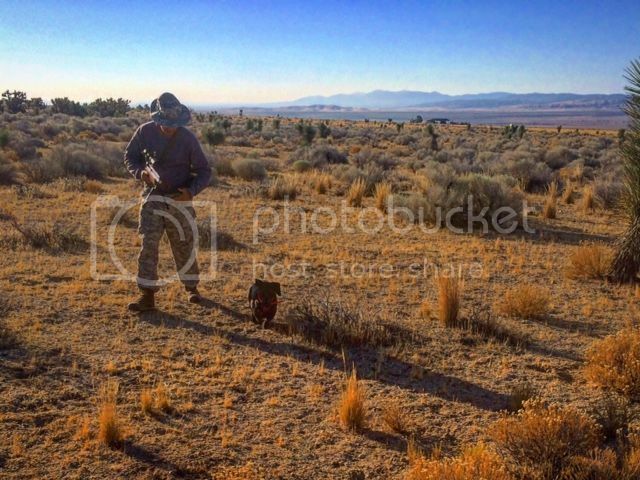 After lunch SteveO and I headed back out several miles working the rocky hillsides with Marley finding several Jacks and even a Cottontail that was hidden in the dense brush. The Cottontails out in this area are quite large and unlike in other areas don’t stop at all once flushed. I think this is because of all the pressure they have due to predators such as birds of prey, Coyotes and Foxes. As we were hiking we spotted quite a few small Ground Squirrels that proved to be very difficult targets as they don’t stay still for very long. SteveO spotted a few and was able to take several of them moving around the rocky hillsides at around 45 yards with his .25 Marauder. We had made several more attempts at finding some Jackrabbits before heading back to camp before dark. The Jackrabbits I think were feeling the pressure of Marley being able to find them even in the most secluded hiding spots. Watching that little dog work is purely magical as she really is amazing at what she does, sometimes its a little unfair. As the evening met darkness it became quite chilly out with the distant chatter of Coyotes echoing through the canyon. Marley and I slept soundly in the Jeep and awoke early to greet Tom and his son Nicholas to our camp where they would spend the next two days. Tom and Nicholas had hunted here before so they both were very familiar with the area and too the potentially huge Jackrabbits that find home here. After getting they’re gear ready and guns filled with air we set out again, this time 6 of us. 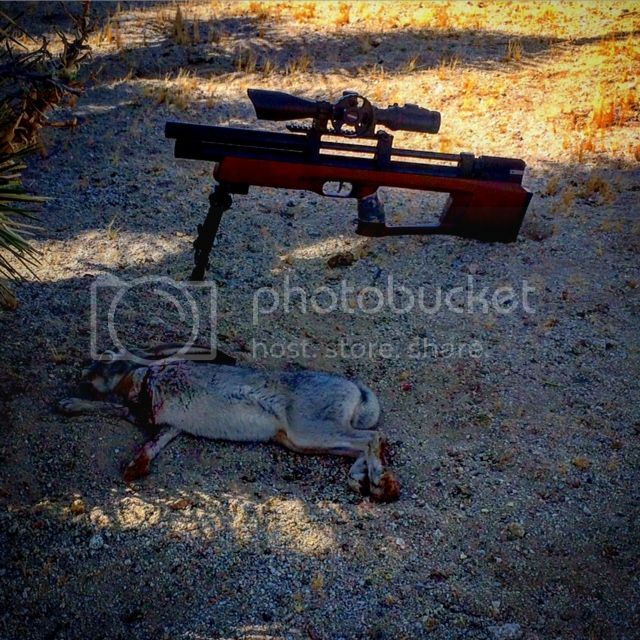 Tom had brought the New EVOL TAC .30 model rifle to test out, what a sharp looking gun it is. 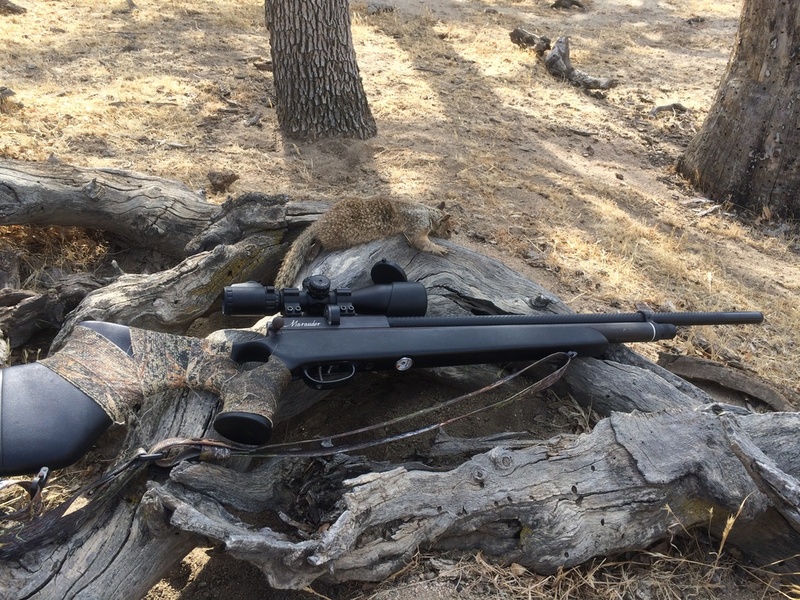 Nicholas was using a regulated bottle fed 22xx platform that was shooting at 30 fpe and has enough air for all day hunting. We ended up all meeting in this canyon where we were shooting at 100+ yards at this white rock, amazing what these modern PCPs are capable of. After some playing around with the guns we headed back to camp where Terry was sighting in his old .20 Sheridan that he just had steroided. 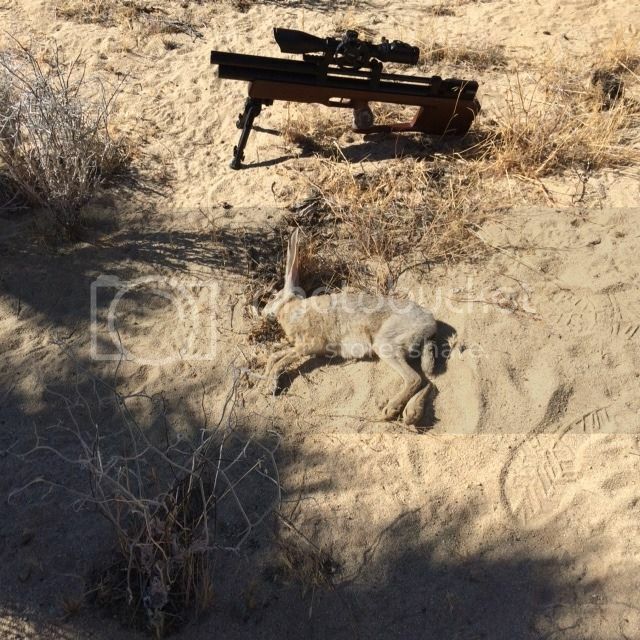 He had mounted a scout scope and planned to do some hunting with it that rest of the day. What a workout it was pumping that old fashioned vintage gun, 6 pumps was giving him 630 fps I believe. Tom had made his way several miles from camp in a close direction from where I was hunting, I had mentioned I had taken 10 ground Squirrels so he made his way to find a few. Tom had managed to find quite a few of them along with bringing back several wild gourds that later would prove good targets. Very old tree, one of the only ones seen for many miles. That next morning SteveO had to leave us to get back home before traffic got to bad, was great to have him join us even though it was a quick two days. This morning was quite foggy and really didn’t seem like a very good morning for Jackrabbits, figured we would give it a try before heading out ourselves. Tom,Nicholas and myself headed out for a short hunt, several mile loop that would bring us back just in time for breakfast. I headed us up into an area I suspected may be full of Jacks and too as a last resort had hoped Tom and Nicholas would have some luck. Here is Tom behind me and Nicholas way in back as we ventured up the steep hillsides. Many of the times when working areas like this you can spot them moving through the brush in the lower areas, I have good success in hunting this way. I would rather shoot down on them than up as usually they make it over a hill leaving them lost from sight. It didn’t take long for all of us to get some shots on running Jacks, Nicholas came very close to hitting one on the run. Tom was higher up the side of the mountain and Nicholas and I were lower, we were watching Tom shoot at several of them with Marley hot on the trail. For a few minutes we were all shooting as they were getting sprung from all directions. I’m really glad we checked out this area as I will definitely be back in Springtime when the population is higher and they are more active. 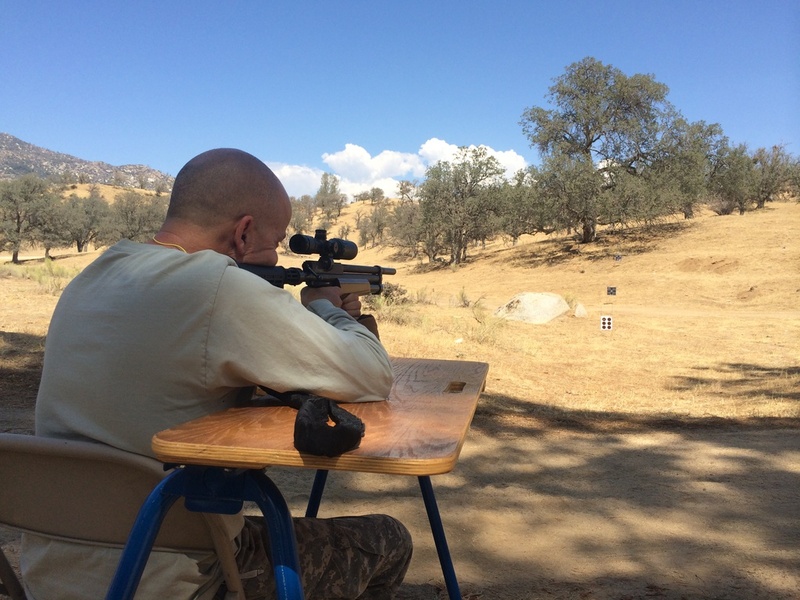 We went back to camp and did a little bit of shooting with the EVOLs and even brought out the .357 Slayer for some fun. This sport has given me so much joy over the years, Its great to see young men like Nicholas getting involved early. These kids are the future of our sport, setting examples and passing it on is the most important thing we can do. Hope you all can enjoy until our next adventure. Thursday night I pulled an all night-er hauling this junk home. 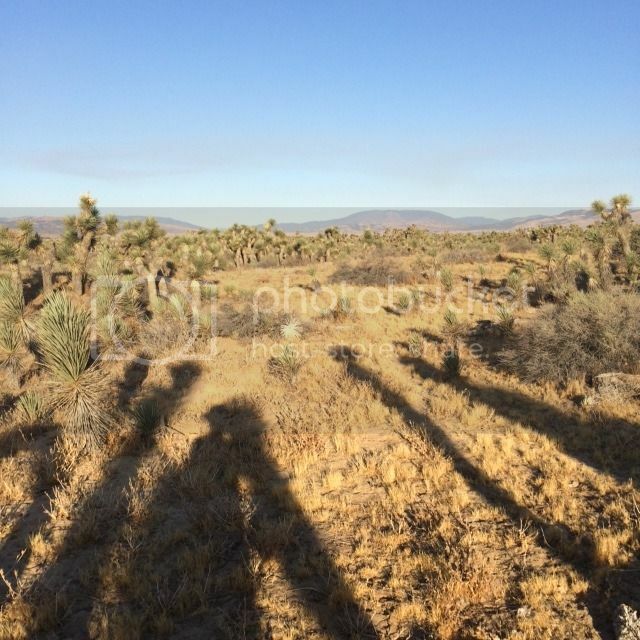 I got up at 4:30 to go Jack hunting in the desert. Good thing Dana was driving since I was dead to the world. But after downing a strong cup of coffee while riding shotgun, I was ready to go when we got to our desert hunting location. This area just stinks of jacks really, but the many Joshua trees make it seem like you’re in a jungle instead of the desert. 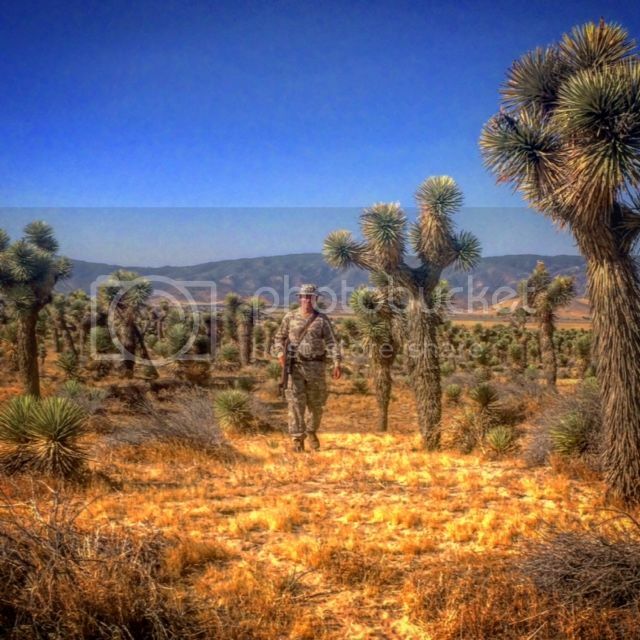 Leading a running jack is tough while they duck behind a tree or sage brush. We split up after a few minutes and I hear Dana taking a shot with his Marauder. 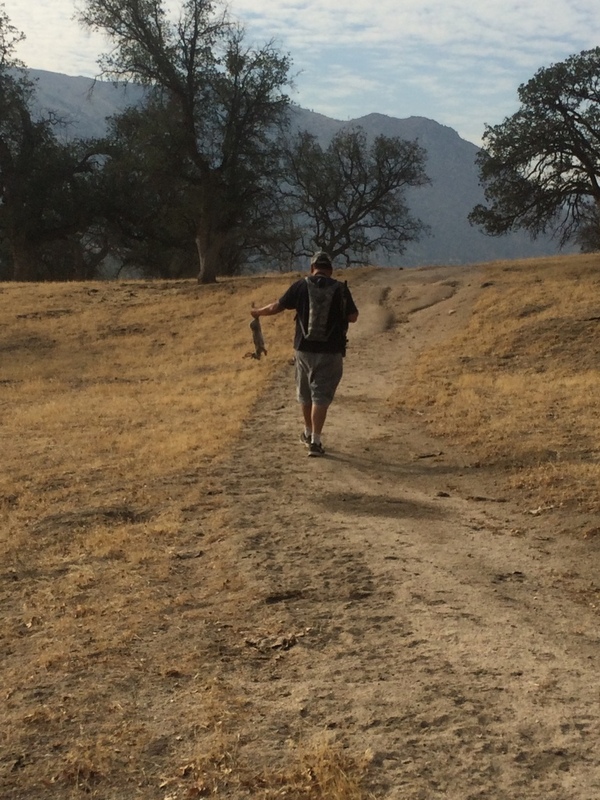 Then a moment later I just barely see a coyote running away from his direction. He had taken a shot at it and missed. Too bad, that would’ve made this report even better. He then got the first jack of the day. I had been spotting and getting a few shots off at some running targets with no luck. I even shot at two that had been hiding under the trees to escape the desert heat. Just as Dana described in his Jackrabbit hunting guide, their tall ears can really give them away. He had been lying in the shade and sprawled out like a dog on a carpet. They say the big ones don’t get that size without being smart. This one wasn’t, and I gave him a JSB, pronto. I wanted to keep going but I had to get home to run errands. What a buzzkill I was. I get a message from Dana Saturday afternoon saying he wants to go back out. “Yeah, I’m in!” This time he packs The Dog. Marley is a three year old Lab/Dachshund mix. She is too cool. Typical hunting dog that knows when you’re ready to go out and can’t wait to get there. So we get after it. We separated, since I was seeing Jacks running one way while Dana was shooting at them in a different direction. I walked up a dirt road while chasing one for maybe 200 yards. I turned around to head back. I like to walk a bit on the slow side while I’m checking the base of trees. Then I see movement to the right of me and a Jack stops 30 yards away. Big mistake for him. I run into Dana and Marley, we see more Jacks running. Good Lord this place reeks of Jacks. Same thing, he chased them one way, I chased them another. I get a text from Dana asking my location. After I reply I look up and see a Jack maybe 25 yards staring at me. I almost drop the phone while he hops away. Then he stops at 50 yards, stands up and I get a shot off. Meanwhile, Dana and Marley are still busy. By this time it was getting close to lunchtime. After hitting the ice chest we decide to jump in the truck and check a different location. After walking about 200 yards I think I counted 6 Jacks running away from Dana while he was taking a shot at one. I wanted to keep after them, but the desert heat was starting to bear down a little bit too much. We decided to bail and call it a day. We have unfinished business out there…. On Friday April 1st, SteveO and I drove North into the Sequoia NF where we met up with several other Airgunners. The weather was a nice cool 79 degrees at 11:30am. We met Terry, Jessi, Ron and Tom along with his 10year old son Nick at our camping area where we would spend the next 3 days hunting ground squirrel. The scenery was absolutely breathtaking as far as how lush and green everything was. The rolling hills were covered in flowers and waist high grass. 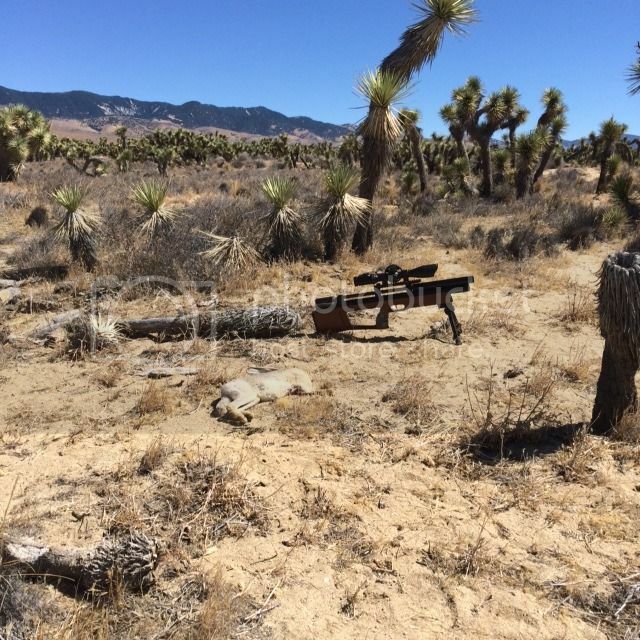 Terry and Ron set up a beautiful target area where we spent some time sighting in our guns. Targets were set up anywhere from 25 yards out to 200 yards. After several hours of target shooting it became a bit windy, still not enough to detour us from venturing out to hunt ground squirrel. 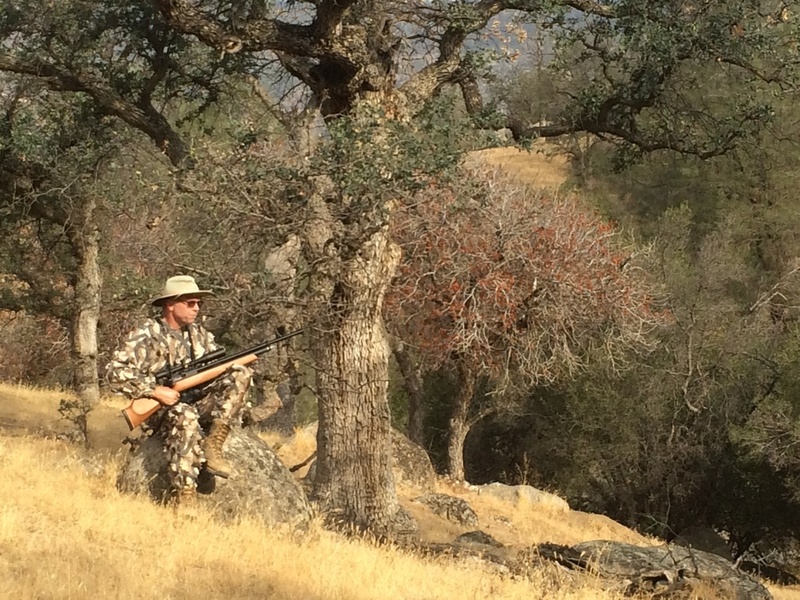 The area we were hunting had rolling hills with scattered Oak trees and very large rock outcroppings. I had set out across a creek where I had hunted the year before. The first thing I noticed was that the tall grass was obscuring my view from the GS holes. The only way I was able to hunt them was to find high ground as to where I could look downward over the grass. This was the way most all of us hunted throughout the trip. By this time it was late afternoon and we all met back at camp where we shared some food, drinks and some stories around the portable fire pit that Terry had brought. The next morning had brought us a beautiful day with no wind and cool temperatures. We spent most of the morning target shooting and plinking with some very nice assortments of Airguns. Ron had brought a good amount of guns, my favorite being a custom 22xx with 40fpe. He had also brought his .30 custom Rainstorm that he let a few of us shoot, first big bore Terry had ever shot. 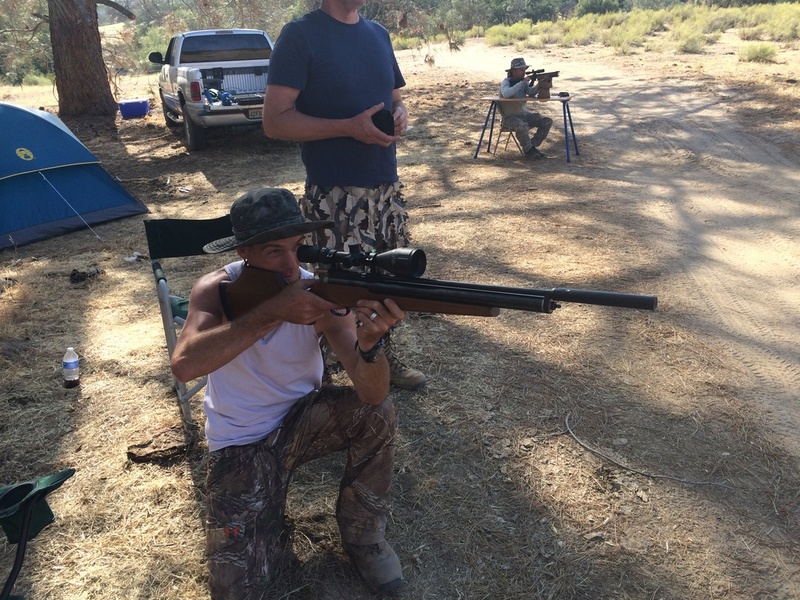 Tom had brought a .308 Slayer along with his son Nick’s custom 22xx bottle fed mini beast. Jessi was using his Cricket bullpup that he was hitting bottles out to 100+yrds. Guys one of the best marksman I’ve ever met. 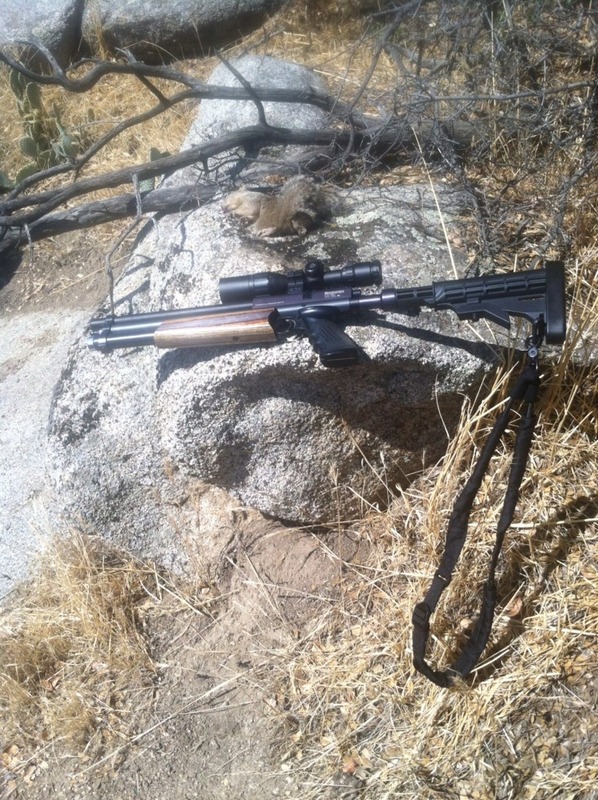 Terry had brought his Tapian Mutant that proved to be super accurate and quiet, very nice looking gun as well. My choice of guns for the weekend was my regulated MK1 LD pistol carbine that proved great out to 75 yards. SteveO hunted with his trusted .25 Marauder that has taken many GS in the past years. Around 1:00pm Tom, Nick and myself headed out to hunt together and to find some long range targets for his .308 Slayer that earlier had been hitting eggs at 200 yards. Within about 20 minutes of hiking I found several GS at 120 yards. Tom was easily able to take one of them as the others never came back out. By the end of the day we had around 20 kills between all of us, SteveO came out on top with 7 kills. The evening was met with more great food and laughs along with a brilliant night sky. The last day we had all gotten up early and headed out in different directions by ourselves. I had chosen a spot in some rocks where I had spotted several a ground squirrel near a fallen log. Ron was several yards to my left stalking a few holes, very frustrating with the tall grass obstructing the view. What was happening was you would spot the grass moving but not be able to take a shot unless you got lucky and found a ground squirrel on a rock or poking out of a hole. Nick had made his way down the hill with Tom where I was able to set him up with a pretty good shot, mind you this kid is an excellent marksman and someone I would hunt with any day. Nick had the perfect shot but unfortunately his bolt had slid open making the shot very weak making a miss. I can say I missed more than ever on this trip but enjoyed time with friends more than ever. My highlight of the trip was the epic scenery and target shooting paired with some of the best hiking I’ve ever encountered. I thank all who came and can’t wait till next year.